It is that time of year when ice anglers begin appearing on Montana’s waters for the ice fishing season. Hagengruber reminded anglers that the variability of ice conditions can not be over estimated. “The safest ice anglers are those who are particular about their ice and who pay as much attention to the condition of the ice as they do the fishing conditions,” Hagengruber said. Dressing to help prevent frostbite and hypothermia is also a basic rule, as is knowledge of ice safety and ice rescue. Hagengruber said anglers should be familiar with the water body they plan to fish, or go with someone who knows that water and how ice tends to form and change there. 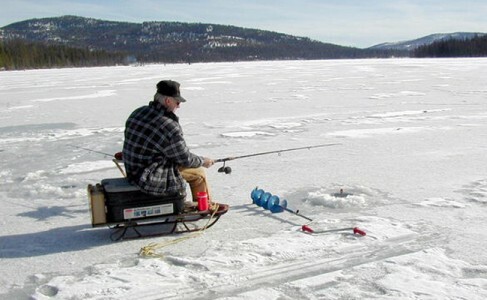 For those without an ice-fishing buddy, he recommends checking out one of the ice fishing blogs, or a website likewww.iceshanty.com, with ice fishing updates, chat and a map of where ice is found in the U.S. and Canada. • Check in with a local sport shop or bait shop before you set out for trip. They should have up-to-date information to share. • If you have even the slightest doubt about the safety of the ice—stay off it! No fish is ever worth a fall into frigid water. • It’s OK to wear a life jacket (PFD) or carry a throwable floatation device—credible ice-anglers do it all the time. • Wear a warm hat that covers your ears. In cold weather, 75 to 80 percent of heat loss from the body occurs from an uncovered head. • Wear mittens – they are warmer than gloves and reduce the chance of finger frostbite.